At the Hillary Clinton event on September 18th, UNH Chief of Police Paul Dean said something that we should all keep in mind: “Take advantage of all this. You are so lucky to have this opportunity.” But take advantage of what? What opportunity are we so lucky to have? This opportunity, my fellow Wildcats, is a political one. Many of you may or may not be aware that UNH has been getting a lot of 2016 presidential candidates lately. In just a three week period we had Donald Trump in Rochester (September 17 and not a UNH sponsored event); Hillary Clinton in the Strafford Room (September 18); Bernie Sanders at the UNH Field House (September 20); and Ben Carson in Huddleston Hall (September 30). Many of them drew large crowds and dozens of news outlets and reporters who may or may not have ruined your day or made you late to class. But, going to school in New Hampshire, this is something that we’ll just have to live with. Besides, those four candidates won’t be the last to come through and, surely enough, they’ll be back in time as well. The 2016 election is still over a year away after all. This is just part of life here at UNH. Andy Smith and Dante Scala, who will be teaching the MOOC on the NH Primary starting October 19th. Now, you may be asking why are all of these candidates coming through and talking to us college kids? Why do we seem so important? Well, there is a reason for that. New Hampshire is a swing state with a lot of pull in the primaries. We are, in fact, the first primary held in the US during elections. Now, you may continue to ask why that is since New Hampshire is such a small state. To which I would refer you to the course being offered online this Fall on the history of the New Hampshire Primaries that starts on October 19. With all that though, why should you care? Why should these candidates stop by and talk to us about their platforms and try to start a conversation with a bunch of 18-23 year olds? And the reason for that is that Millennials (defined as those ages 18 to 34 in 2015 though some would continue this definition to include those with a social media addiction) have a lot of pull during elections. We are that target youth group that all of the candidates want in order to tip votes in their favor. Yet we are the group that seems to care the least or has a history of low turn out when it comes to voting. Personally, I love being able to use my right as an American citizen to vote. I’m from Connecticut and for every election, I fill out my absentee ballot so I know that my voice will be heard even when I’m at school out of state. And because I take advantage of my right to vote, I always try and make sure I have an understanding of the candidates, the issues, and what is being promised to the American people. You should too! The two biggest events that I attended so far in this political cycle were Donald Trump and Bernie Sanders, with Hillary Clinton running a close third and followed by Ben Carson. These events all required me, and whoever I was attending with, to get to the venue an hour early. And even that isn’t always enough. 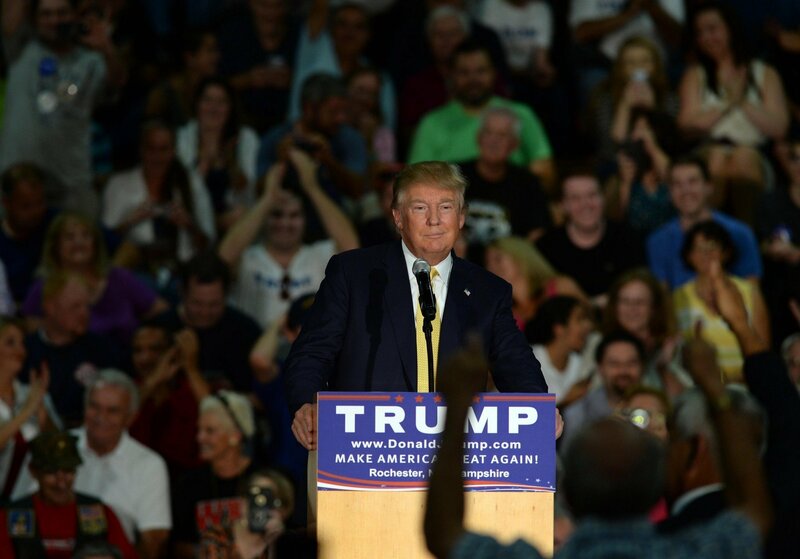 Seeing Donald Trump in Rochester proved that even an hour early isn’t always enough time. My roommate and I arrived around 6pm for an event starting at 7pm and found that just trying to get into the high school gym was going to be a nightmare. Some people had arrived hours earlier to get prime parking space and by the time we were trying to park, we were left way out in a field. We still managed to get in and get bleacher seats behind Trump. Hillary Clinton addresses student loans and interest rates with UNH Students on September 18. Being early doesn’t end at parking problems though. Some candidates have been in the political circuit for years so they come with their own security, as was the case with Hillary Clinton and her round table discussion on college affordability. When making time to head to some of these events, you’ll need to factor in how long any security check points will take to get through. So think ahead, bring the smallest amount of things you can (think your wallet and cellphone and that’s it). Be prepared to get patted down and don’t make a big deal about it. This is just a safety precaution. And, it would seem, most events won’t make you go through that. Bernie Sanders speaks to an at capacity crowd at the UNH Field House on September 20. They will make you go through everyone’s favorite amusement park ride: waiting in line! Another great reason to get to an event early is to avoid the longest line possible. During the Berne Sanders event on September 20, the line to get into the Field House went from the doors all the way back to the recreation fields. To avoid being so far back, some people arrived around 4pm, or earlier, for the 6pm town hall meeting. It may seem insane to get to an event two hours before hand but sometimes, it’s just worth it. Getting there early can also get you some perks besides your choice of seats. Many of the candidates travel with lots of promotional things such as bumper stickers and magnets as long as you sign in to the event. At Ben Carson’s event on September 30, he was giving away the book Ben Carson: Rx for America by John Phillip Souza IV. So even if you don’t consider yourself a Carson fan, you can read up on why so many people are. Most of the candidates that are coming through campus will make you RSVP. They may not ask you to show proof that you did but you should do it anyways. Although that will mean that you will probably get a ton of extra emails from all of the candidates who you go and see (I’m personally at seven a day at the minimum from Clinton, Sanders, and Carson). RSVPing just means that you are guaranteed a spot at the event. Even if you just look up information about the candidate’s platform while you are waiting in line to get in or waiting for them to come and speak, make sure that you do some basic research. Try and find what their key stances are and maybe even check out some other interviews or town hall events that they’ve lead. Depending on the source you may have some bias or have to deal with trying to see past the editing of News Company, but at least you’ll familiarize yourself with this potential president. Ben Carson takes a selfie with a student on September 30. I know that going into all of the events I had varying levels of knowledge about the candidates. I honestly had no idea who Ben Carson was when I heard he was coming and confused him for Michael Steele, the former RNC chair until 2011. That confusion is why you should definitely at least do a basic Google search on any candidate coming to the area. It is really hard to know if you should support a candidate or not if you don’t form your own opinions or know which issues matter most to you. To help you figure this out if you don’t know already, check out this online quiz: I Side With. It will take you a decent amount of time to go through but by the end, you’ll have a good idea of what the main issues are for this political cycle and where you stand on them. The quiz will even list off percentages of how much you side with each candidate. So set aside an afternoon and take this quiz. And if you want to do some more, carry on with tip three and do some more research. As Ben Carson said at his event in Huddleston Hall, “We are not republicans and democrats first, we are Americans first.” Try to keep that in mind as you attend these political events around campus and the area over the next year or so. If you side more with the democrats, stop by a republican event. If you side more with the republicans, attend a democratic event. Think about the issues that are most important to you and listen to what the candidate from the other side has to say. Maybe you’ll find something you agree with. Maybe you’ll listen to the candidate you thought you liked most and find that you disagree with them on the issues that matter most to you. Just listen to what the candidate has to say. You can even ask them as question at almost all of these events. Trump, Clinton, Sanders, and Carson all offered a Q&A portion during their town hall meetings. All you have to do is listen and then find the mic runner to share your concerns and questions. The take away from all of this is that as members of the University of New Hampshire community we are extremely lucky to be in this situation. By going to this university, we get the opportunity to possibly shake the hand or take a selfie with the next president of the United States of America! So be involved; stop by an event and listen to what these candidates have to say; do some research and know where you stand on the issues; make your own opinions. Is that what our professors have been asking from us all along? In the end, enjoy the experience. It only happens every four years!